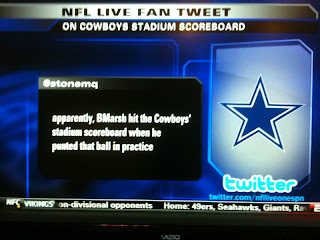 My tweet made it onto NFL Live! AND in his ears! 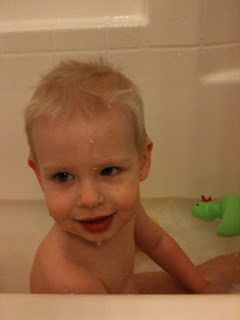 Yes that's right, oatmeal in the ear! 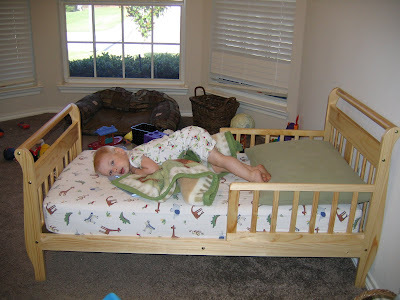 We weren't going to get a "toddler bed" because the crib we had converted to a toddler bed, but after a few weeks of Luke getting bruises on his legs that never seemed to go away we re-evaluated. 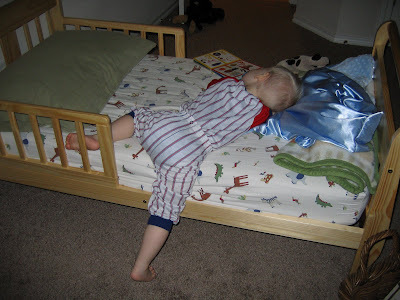 And it wasn't until I noticed that every time he climbed in and out of the crib/toddler bed that his shins were hitting on the guard rail. Here is a picture of his legs, they actually look a bit better than they have in the past. We decided that we couldn't have him with bruises all over his legs all the time! It just looked bad! Here is a picture of him the first day! He liked it right away! So did Ender, but we already posted a picture of that, so I'm not re posting one! After checking on him the first night, we decided to put his bed along the wall the long way, so he would only have a little space where he could fall out... which he did, so now we put the pillow at the foot of the bed, and he has done much better! Things worked out even if we weren't going to buy a bed. It was cheaper than putting him in a twin bed...we would have to buy a twin mattress, twin bed frame, twin bedding....etc... And it's just too cute! So now our plan is (which always seem to change when we make them!) is to just wait until Cassie needs to be in a twin bed (maybe 3 years?) and just but them at the same time, maybe bunk beds that we can separate if we need to. 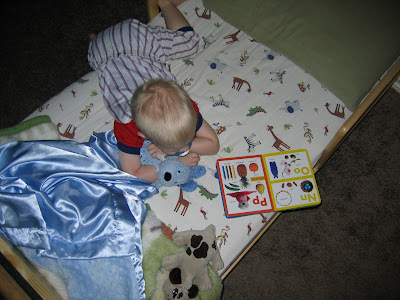 We love how every night he has random things in bed, this night it was a book, a pound puppy (from when I was a kid! 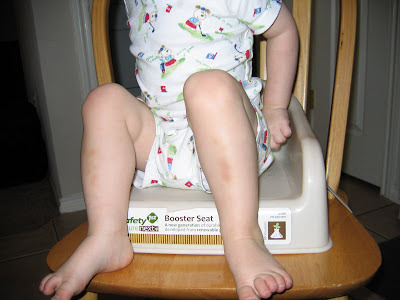 Do they even still make those?) an of course he ALWAYS has his doggie! This post will be all about Luke! The other day we were in Luke's room reading a bunch of books. He would bring me book, after book, after book. He then handed me this book to read. 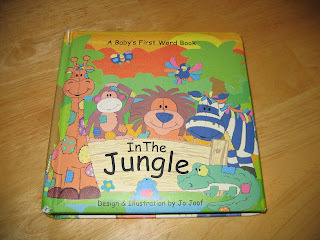 We read this book a lot and when we read it we make some of the animal sounds. 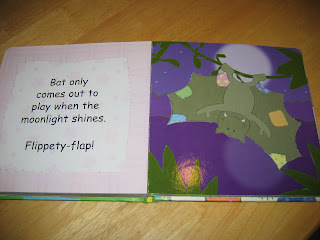 he takes the book out of my hands and turns the book upside down so that it looks like the bat is right side up.... somehow he figured that if all of the other animals were right side up, then the bat needed to be also! His bed time is still 6pm. 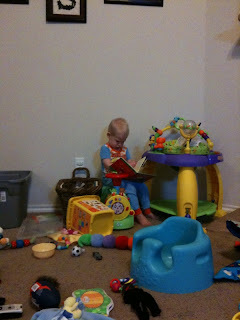 He doesn't always go to sleep right away... he will climb out and play with his toys, read his books, or whatever. We don't mind, he's happy and when he does get tired he gets in bed and goes to sleep. 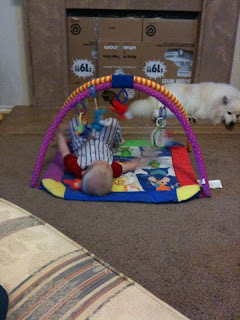 A few nights ago we could hear him playing with his toys, more specifically his Legos. Things were quiet in his room, and then a couple of hours later we heard him start to cry so we went in to check on him, Michael went in and then called me in. Luke had all of his Legos in bed with him and we figured that maybe he rolled onto them and that's what woke him up. As we were about to put them away we noticed that after he dumped the Legos into his bed, he put the Lego container back where he got it from with the lid on and everything! We had a good laugh! Here are Luke and Cassie at about the same age, just over 2 months old! 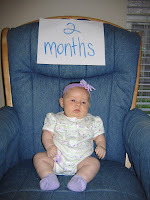 And because I never posted an official 2 month picture of Cassie, here it is! I can't believe how fast these past 2 (2 1/2 now!) months have gone! She does really good during the day, but at night she usually has a few hours where she gets really colicky, so we usually never call anyone, or answer phones, not that we are avoiding anyone... we just won't be able to here them! 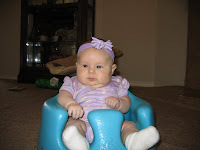 Hopefully soon she will grow out of the colic, because I need more sleep! The other day in my sleep I told Michael that my throat felt like a pterodactyl.... I have no memory of this! Luke is doing good, he still is only doing one nap, but atleast now it is in the afternoon for a few hours. And since we put the toys in there, he plays before his nap and a bit after too, so that gives me more time to try and catch some extra z's! At night before we go to bed and when we check on Luke, it's so cute to see the random things that he brings in bed with him! 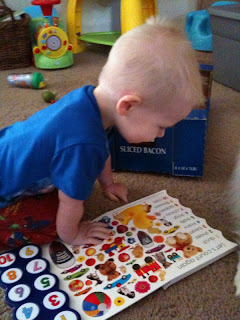 A book or two, his shapes from the shape sorter, his pull toy dog (we had to wrap the string around the toy so it would be safe) but most of the time there are stuffed animals! Way cute! was cute as we rounded the corner to hear him saying 'woof! woof!'. 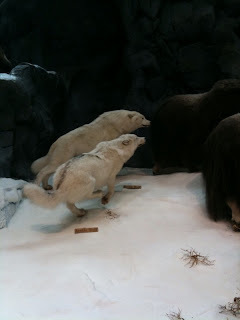 ...that we have been update happy here at the blog! It's a good thing, really! We have figured out (and by we I mean Michael) how to blog from our iPhones! It's really easy! So if I don't have the regular camera with me and one of the kids does something cute, I usually have my phone with me and can snap a quick picture or video and post it later! It will also be easier to blog when we are out doing something, or out of town! 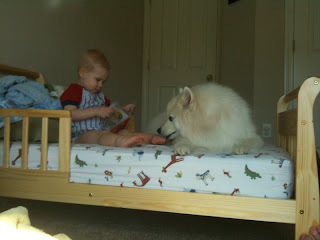 We have also been updating Ender's blog! And now that blogging has become that much more convenient, Michael will be blogging more here! Hmmm, lets see, we had to have Terminix come out and treat our house for carpenter ants. 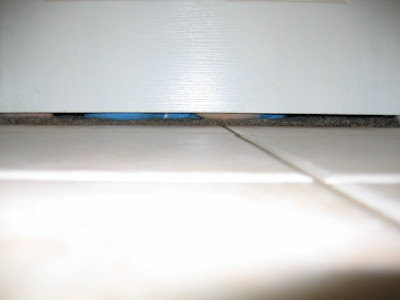 We were glad that they weren't termites, but if they had been at least we had the termite protection. 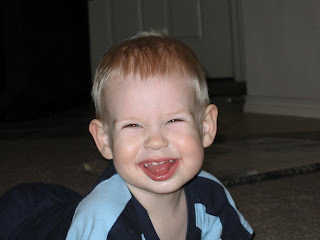 We are also glad that we have a contract with Terminix, because we have had them out (at no extra cost, yay!) probably 4-5 other times besides the quarterly scheduled visits they provide, so it has been well worth it! Ender's family reunion is coming up in September, sadly we will be missing it again. We have never been able to go, but hope to go maybe next year, even if we do say that every year, I think we mean it this time! 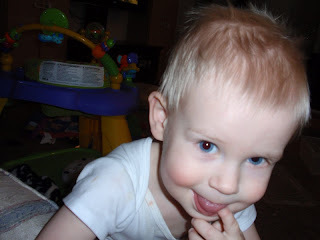 I can't believe Luke will be two at the end of October... where has the time gone. We are excited to be here for Christmas this year, but sad that we might not get to see a bunch of family. We will be buying a tree soon after they get to the stores. And we just might have to set it up and enjoy it that much longer! We have gone 7 out of the 9 Christmas holidays without a tree... but wherever we were there was a tree for us to enjoy, it just wasn't ours. And we can't believe that we have two kids for Christmas this year! It will be exciting to see Luke really getting into it this year since he was too young the past two years, and Cassie will be about 6 1/2 months old! Well, be sure and check back often to see what's new! 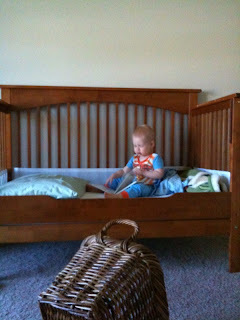 Luke likes to read in bed! knows, maybe at her next appointment she will have shrunk! are pretty close in growing the same! I love this picture if Luke! busy for 10 to 20 minutes! 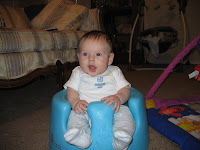 Luke spending time with footstools. 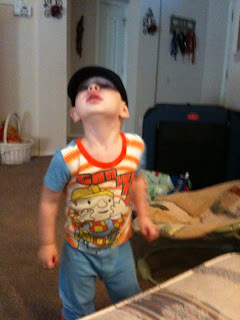 This was a photo Angela took of Luke when she came to visit.